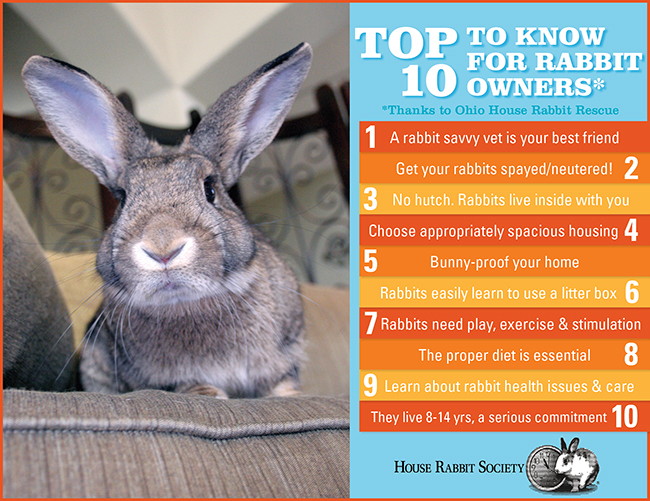 What are the 10 most important things a new rabbit guardian should know? Ohio House Rabbit Rescue asked their supporters and fellow rabbit rescuers this exact question. People from all over the country responded. The resulting list is such a helpful guide, especially if you are just getting started. These ten important things are exactly what potential adopters need to know before they adopt. They also serve as an excellent benchmark for experienced rabbit owners. Whether you are new to rabbits or are in the first years of rabbit ownership this list covers some of the most important things to learn about your new friends. 1. A rabbit-savvy vet is your new best friend. 2. Get your rabbits spayed/neutered! 3. Think outside the hutch and inside the house. 4. Make sure you choose spacious housing. 6. Rabbits can easily learn to use a litter box. 7. Rabbits need play, exercise and mental stimulation. 8. Feeding the correct diet is essential. 9. Educate yourself on rabbit health and care. 10. Rabbits live 8-14 years — they are a serious commitment.